Executive Coaching – Science, Art or Snake Oil? When is Executive Coaching the right answer? For the purposes of this blog, I’m talking about coaching business Executives for professional development purposes. I’m not talking about professional psychological counselling, or life coaching or other forms of coaching that seek to look more holistically at the person, their personal needs and how to support them. I’m focused on a narrower view of coaching to develop or improve performance in the work setting. In my discussions with my clients regarding the development of their people, we often explore the options and avenues available to build individual capability in a more focused way. The discussions increasingly touch on getting the balance right in matching the approach with the development requirements and desired outcomes. Often it’s important to make the distinction between whether the need is for a remedial intervention; to address a specific area (or areas) that are immediately impacting performance or development i.e. enhancing capability by building on an already effective skill base to leverage potential. Different approaches and tools are used in each case, and the discussions typically touch on what approach can best address the specific need. Morgan McCall, Michael M. Lombardo and Robert W. Eichinger (the last two of Lominger fame) working at the Center for Creative Leadership (CCL) are usually credited with originating the 70:20:10 ratio in 1996. Most of the HR and OD/L&D professionals I talk with are increasingly focused on building ways and means to leverage learning through the 70:20 supported by the 10. I like the saying “If you want to learn how to do something… do it!” I think it captures the essence of what is captured by the 70% of the model. 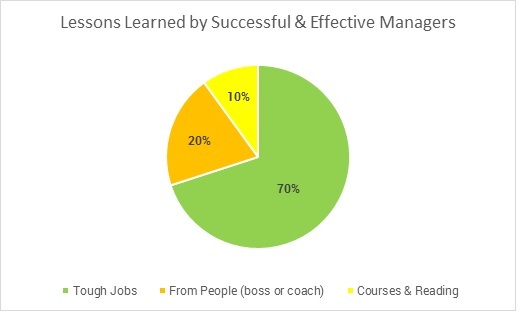 People learn best through experience, but they don’t always learn the best way… that’s where the remaining 30% comes into play, and this is where effective Executive Coaching resides. Bundled together, these separate data points provide rich insights into the individual’s style and ways of working that provide a pragmatic and factual basis to construct a coaching plan. Coaching is not just about talking or listening (although they are important elements). It is all about discovering, learning, developing and changing. A structured approach (something as simple as an action plan) is necessary to ensure goals are set, actions agreed and outcomes achieved. There are virtually no barriers to anyone who is so inclined to hang out a shingle and call themselves an Executive Coach. So how do you pick the one that is right for the particular Executive, your organisation and the outcomes you require? The right coach has the right experience, they have worked the tough jobs, made mistakes and learned from them, experienced failure, recovered and succeeded. Therefore, they have the benefit of experience from the 70% component that they can then apply as part of the 20%. They should have a proven approach, structure, tools and philosophy that they’ve used and proven before. What’s the planning approach they use? How do they get the executive being coached to engage? Coaching is a relationship-based process that is predicated on the Coach and the Executive having to have the right chemistry. This can usually be done through some desk-top matching and then an initial face to face meeting prior to engagement. So where’s the Snake Oil? Well, there is none (or shouldn’t be). Effective coaching requires knowledge, expertise, experience, structure, tools and talent. A good coach not only supports the Executive to develop but does so with a high level of awareness of the context within which they need to succeed. Coaching also takes time and perseverance to achieve lasting results. As with all things, if the promise sounds too good to be true it probably is. When you’re next selecting a Coach, look for strengths in both the Science and the Art. Dig into their process and approach and satisfy yourself that the fit is right. And be aware of someone selling Snake Oil!